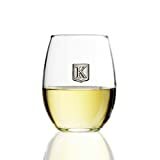 Fine Occasion Personalized Stemless Wine Glass with Letter Crest – My Home Wine Bar ! Amazon Price: $13.99 (as of January 26, 2019 7:31 pm - Details). Product prices and availability are accurate as of the date/time indicated and are subject to change. Any price and availability information displayed on the Amazon site at the time of purchase will apply to the purchase of this product. Personalized Stemless Wineglasses – the Perfect Gift ! If you are looking for a thoughtful and elegant gift, look no further! No matter the occasion – birthdays, holidays, weddings, graduations, anything – these monogrammed stemless wine glasses are ideal! Perfect for an anniversary, housewarming, Christmas present, Xmas stocking filler, kitchen gifts, bachelor/bachelorette party and much more. ★SUPERIOR QUALITY MATERIALS★ Only the best! Our 15 and 21 oz. stemless wine glasses are made of top grade, lead free, hand blown tempered glass. The crests are made from pure pewter and hand-polished, so that each of them is unique and great-looking. Hand Wash Only! ★CHOOSE YOUR PERSONALIZED LETTER★ Each wine glass comes with a custom letter crest of your choice. It could be the initial of a name, a family name, a state, sports team, university, fraternity or anything else that matters to you! Why not pick up two and make it a set. Featured glass is 15 oz – 21 oz is also available….. NOTE – Don’t forget to select the correct Personal Letter !! !